Kickstarter has become a haven over the past year or so for the bold and intriguing, from the smash success of Cards Against Humanity – now with two expansions released and a Giant Bomb-themed third on the way – to the record-breaking Double Fine Adventure. At PAX Prime this past weekend, the grassroots funding site hosted a handful of projects from their growing collection in the Kickstarter Arcade. Included in the small room were stacks on stacks of Cards Against Humanity, DS darling Diamond Trust of London, and one of the most intriguing and strategic card games about the apocalypse that we’re likely to see for a long while. Beware the Tongue, for his domain is all slimy and dangerous. Guts of Glory designer Zach Gage greets me on an early Saturday morning, tired but seemingly excited to play his Kickstart-in-progress game with me. 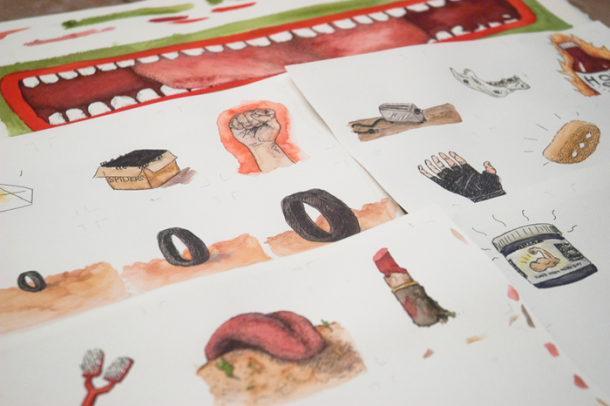 A “surrealist post-apocalyptic eating contest”, Guts takes the ideas of complex deck-building games like Magic: the Gathering or Ascension and wraps them in a humorous sheath. The goal? Be the fiercest eater in what’s left of this strange world, collecting Glory points while chomping down on tires and toasters and carefully managing what’s in your mouth. If that sounds complicated, don’t worry too much. With just two types of cards, blue ones denoting food items and green cards identifying condiments, Guts is a game that’s deceptively easy to pick up. While the full game will support four players, our match in the Arcade pits just Zach and myself against each other. We’re using a special starter deck to learn how the game works, showing a glimpse at the underlying complexity and strategic decisions that govern mastication in post-apocalyptia. The card design is intentionally simple, free of mountains of special symbols and paragraphs of flavor text. Each turn consists of three simple phases. We fill the central plate, allowing us to pick one of three options to feed on. A player can only fit two food cards and three condiments into their mouth at any one time, and taking something from the plate is mandatory every turn. 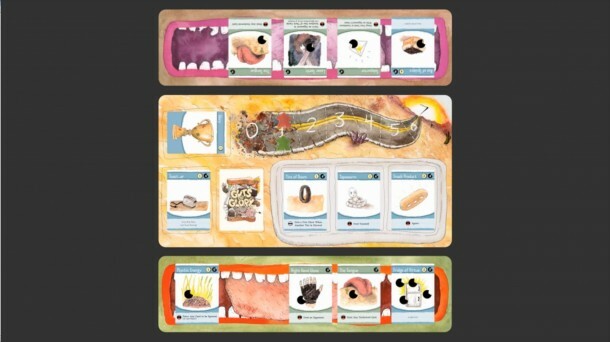 To make things more interesting, each card comes with a toughness rating designating how hard the object is to swallow, but players only get two “chew tokens” per turn, both of which must be played on separate cards. If you don’t play your cards and tokens right, your mouth fills up and you’ll have to spew a food item at your opponent, increasing its Glory value in the process. After all, it’s more glorious to eat something someone else couldn’t handle than fresh food off a clean plate. Elements of deck-building games seep in to make the eating contest a much more strategic affair as each turn passes. While some cards simply exist to be devoured, most have special effects that can shift the balance of power on a turn-by-turn basis. These fall into binary categories as well, with powers that are active as long as they’re in your mouth or other abilities that show themselves upon swallowing. 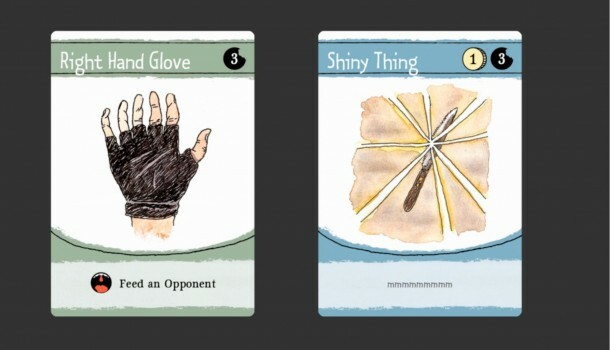 With the right combo of condiments and food, players can gain extra chew tokens every turn, place two tokens on a single card each round instead of taking one bite from two items, or even force their opponent to feed themselves extra cards from the plate. A glimpse at a 2-player game in progress. This game is just getting into tactical territory. The duel starts off simply enough, with our mouths filling up and Glory accumulating bite by bite. The De-Masticator makes an early appearance, clearing all chew tokens from Zach’s 4 toughness Tapeworm. He rallies back, the precious Hot Hot Hot Sauce allowing him to chomp down on a stream of condiments as long as it remains in his mouth. It’s not until our gullets are both full and we’re forced to draw another card that things get interesting. Stakes get higher as cards get spewed, a violent vomit volley passing condiments and food alike between the two of us until one player passes at last, forfeiting the card and any extra Glory it would have granted. As I begin to approach the victory threshold of seven Glory, turns get harder and harder to take, each card presenting new solutions and frustrating problems. Even forcing Zach to swallow his Hot Hot Hot Sauce, thereby feeding him the entire plate, doesn’t buy me much time. He laments about the possibility of losing at his own game, but the cards are in his favor. With a Side Jaw condiment card granting him an extra chew token each round and my spewed Dentures allowing him to chew food twice in one turn, he crunches down on a Toaster, amplified to a staggering three Glory from two separate spews, snatching victory out of my clutches. It’s a solid plan, made all the more frustrating by my allowing it to happen, but that’s the effect of being forced to spew your guts out and make the hard decisions that show up as the game progresses. Turns become exercises in planning ahead and utilizing condiments to their fullest, and it was on that field that I was outmatched. The art on the cards is intriguing but simplistic, readable but not too showy. Guts of Glory isn’t quite finished yet, either: Gage is still designing new cards with more complex and dastardly strategies that come along with them. Food with negative Glory that grants large chewing bonuses, condiments that allow you to swap chew tokens between your cards, and others that all add extra layers to a meta-game still in its infancy. Even now, I find myself thinking about ways I could have eaten differently, slight changes in strategy that could have altered the course of the latter half of the game. With just over three weeks left on its Kickstarter campaign, the game seems poised to clear its goal and then some, stretch goals fleshing out the concept before it reaches a state of final production. As a parting gift, Gage hands me a prototype version of the game, a starter deck that mirrors the set we had just thrown down with. Since then, I’ve started plotting and scheming up ways to out-eat the next person I come across in this calorie-laden wasteland. When that day comes, I’ll be ready to prove I’m the best eater in the world, but part of me will be waiting for the next showdown with the game’s quiet mastermind. You can check out the Guts of Glory Kickstarter here. $5 nets you a downloadable version of the game, while $25 will get you the full boxed version. Having been raised on a solid foundation of MMOs and platformers, Dylan is a second-generation gamer with an excitable nature. He thinks there's always something to appreciate about a new idea, and at the end of the day he hopes to shed a little more light on how and why games make us tick.